Hide deals from seller "Paradise Florist"
Hide deals from category "Florists"
Limit 1 per person. Valid on a summer bouquet. Promotional value expires 30 days after purchase. 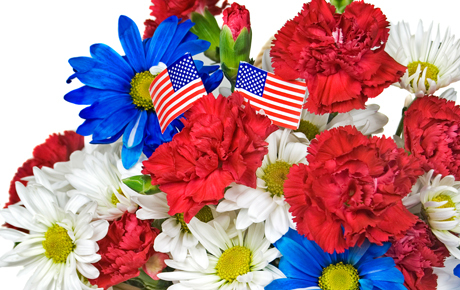 Add some sparkle to your Fourth of July celebration with 50% off a summer bouquet from Paradise Florist in Hoffman Estates ($10 value). Whether you are looking for a hostess gift or the perfect centerpiece for your own soiree, this summer bouquet is sure to brighten up the table. Paradise Florist has been in business for an impressive 25 years, offering fresh and silk floral arrangements as well as balloons and gift baskets. Their friendly, prompt service and attention to detail guarantee a pleasant shopping experience. Plus, this floral shop buys their flowers directly from growers in order to provide the freshest flowers possible. The summer bouquet includes white daisies and carnations, blue statices, baby's breath and a red miniature carnation for a colorful homage to Independence Day. A florist in Hoffman Estates offering fresh and silk floral arrangement.